Romance is in the air along the Mexican Caribbean coast with a luxurious getaway to your Mexican Shangri-La at Palace Resorts - Sun Palace. Couples find their dream Cancun escape among sunshine, palm trees, a bottle of sparkling champagne and romantic candlelit dinners. Walk along the beach and immerse your toes in the sand in one of the world's most beautiful beach destinations. A timeshare at Palace Resorts - Sun Palace features studio and one-bedroom layouts with comfortable amenities like name brand bath amenities, private balcony, a bottle of wine to express welcome, purified water, snacks in the room, double whirlpool spa tub, mini bar and snacks. In the bathroom you'll find robes, slippers and bath necessities. 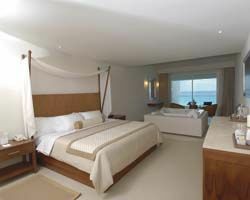 These Cancun timeshares for sale comes with luxe benefits! At your resort, you'll find infinity pools, an indoor pool, wireless Internet, a swim up bar, fitness center, 24-hour room service, spa, daily activities, and nightly entertainment. Dining options let you dine in pure romance, as you experience tempting cuisines like Italian, Pan-Asian, American and Mexican. Golfers adore the challenge of a Jack Nicklaus designed golf course just outside the resort complex. For a true pampering experience, visit Sun Palace Spa and feel your cares slip away. Enjoy a salon experience in the resort salon before your romantic night out. Spend an afternoon relaxing by the infinity pool as you gaze out over the crystal blue Caribbean Sea. 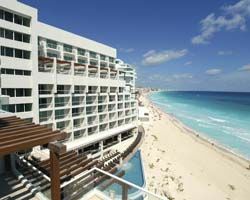 This becomes your new way to spend your days when you buy one of the Cancun timeshares for sale available here at BuyaTimeshare.com. If adventure and touring are more your style, embark on an Ultimate Dolphin Swim experience to hug and kiss gentle dolphins, with training beforehand by expert dolphin trainers. You'll want to be sure to bring a camera! Trek to the archaeological site called Tulum. Here you'll discover the place where the Mayan Empire once governed. A trip to Wet 'n Wild Water Park thrills water adventure lovers. You'll soon find yourself longing to return to Palace Resorts - Sun Palace timeshare for more. Contact Palace Resorts - Sun Palace Specialist Today! Days: Friday, Saturday, Sunday, Monday, Tuesday, Wednesday, Thursday / Time: 3:00 P.M.
Blvd. Kukulcan Km 20, Hotel Zone.